Click here to see The Japan Foundation, Sydney e-newsletter April 2016. 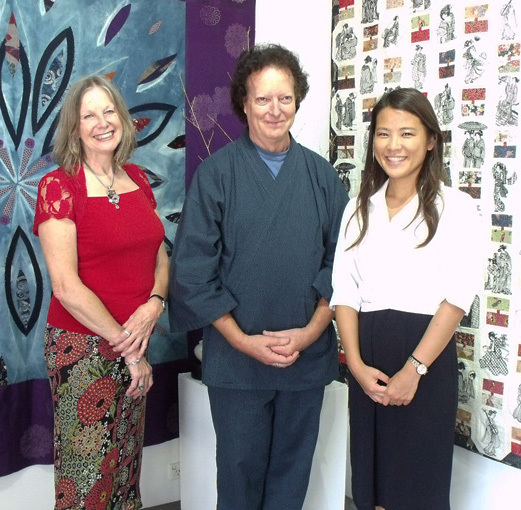 Nicola Coady, Alan Tremain and Ayusa Koshi (Japan Foundation) at the exhibition opening. 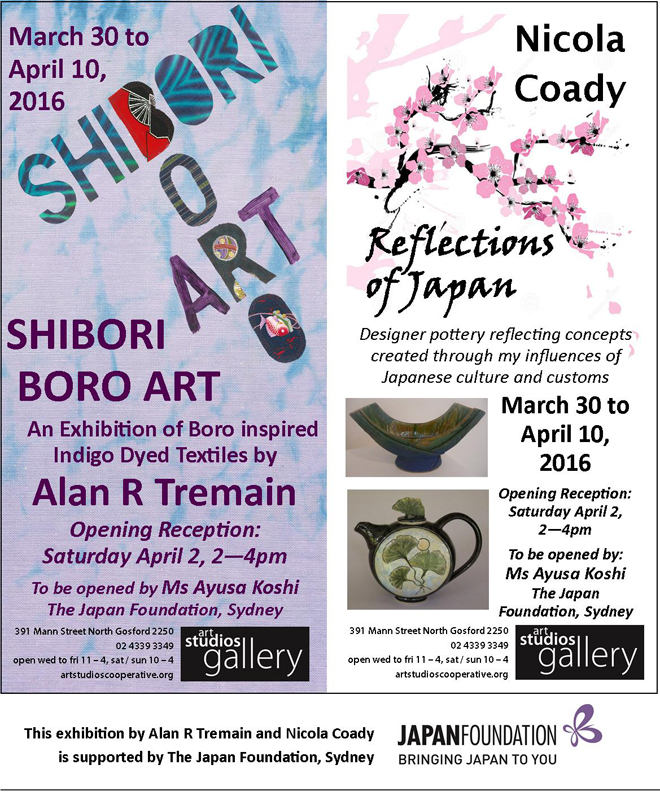 Alan R Tremain's 'Shibori Boro Art' exhibition featured boro inspired indigo dyed textiles, in conjunction with Nicola Coady's ‘Reflections of Japan' designer pottery, and ran from Wednesday 30 March to Sunday 10 April 2016 in the Art Studios Gallery, North Gosford. The exhibition was supported by The Japan Foundation, Sydney. Boro (textiles) – derived from the Japanese onomatopoeic boroboro, which means something tattered or repaired, demonstrates esteem for our available resources, labour and everyday objects. The earliest known example of cloth dyed with a shibori technique dates from the 8th century. There are an infinite number of ways one can bind, stitch, fold, twist, or compress cloth for shibori, and each way results in very different patterns. Each method is used to achieve a certain result, but each method is also used to work in harmony with the type of cloth used. 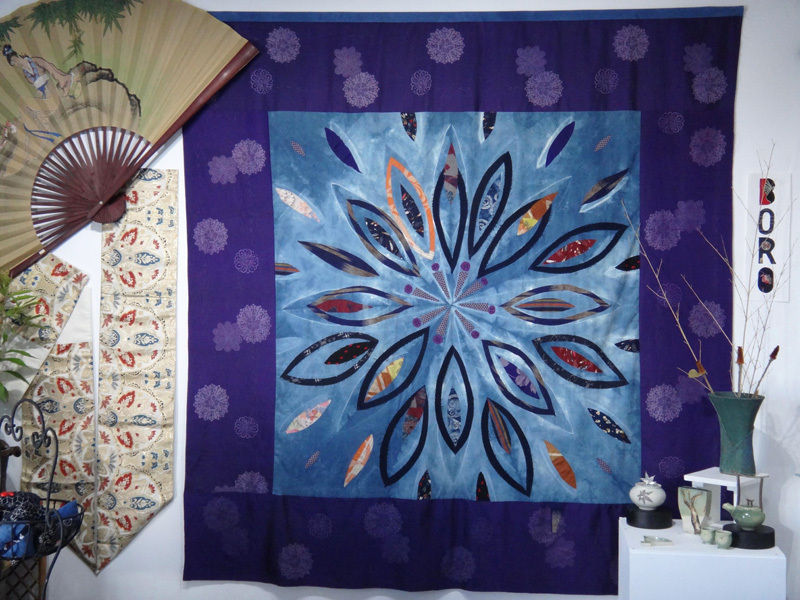 Alan has designed and created an exhibition of original textiles, which includes layered bed cloths, interior décor textiles and limited fashion accessories. Nicola's designer pottery reflects concepts created through her influences of Japanese culture and customs. Click here to view the Media Release for the exhibition.